Quixote’s last stand – named after the famed windmill tilter. Eclectic, knowledgeable, unstoppable – like the man himself. A great compendium of news updates and other info. Ruralgrubby’s Windwatch – a manual for fighting big wind, lots of good information and well worth a look. Visit here to find STT’s Canadian wind turbine stories. STS: some grist for your mill! About 14 years ago, long-term environmental activists like Gerald Butts, along with Dalton McGuinty and the Ontario Liberal Government of the day, were the mis-guided architects of Ontario’s current and future power malaise. Ontario continues to be haunted by this abuse of common sense, political power, expert advise, and sound planning for one of the most critical elements of our society – electrical energy. In one of his biographical notes, Butts is credited with being closely involved in all of the government’s significant environmental initiatives, and as McGuinty’s principal adviser, he developed scenarios and studies that provided a succession of energy ministers with a direction that would phase-out coal and reduce toxic wastes, and introduce new forms of renewable energy to the province. This motley crew, among other green enthusiasts who were blinded by images of wind and solar-generated electricity, not to mention the financial benefits which could accrue to those on the inside of government circles. The end result was a vast array of wind turbines strung across the province, all connected to the Ontario power grid. This process began with the innocuous installation of a few wind turbines, which eventually became wind farms, a further extension of the fallacy of wind energy as a reliable source of power. This extension of the wind power fallacy was a further rejection of expert advice on how these renewables would integrate into the power grid, where the components would be located, what the impact would be on the populace, and how hydro bills would be affected. A feed-in tariff program was put in place to force the taxpayers of the province to accept renewable energy generators like wind turbines and solar panels, whether they wanted them or not, and more importantly without a business plan which would balance the cost of the program, invite business participation, and provide valid benefits. There is an old axiom which says “if you want a project to fail, put it in the government’s hands.” And that’s what happened. As an engineer, I can appreciate that wind turbines can form a part of the electricity generating grid, where appropriate, that is, where topography, mother nature, regulatory bodies, and the acceptance of the local populace, combine to provide a viable environment for the generation of electricity using the power of the wind. Several European countries currently generate a significant percentage of their electrical energy from wind power, and have for some years; for example, Sweden (10 percent, 2015), Germany (13 percent, 2015), Denmark (42 percent, 2015), among others, with even more potential for wind-generated energy in the years to come. These countries embarked on the path to wind turbine power generation with at least some assurance that the plan would be successful, locating wind farms in areas, often offshore, where the wind blows consistently, both in direction and speed, making energy generation reasonably predictable. electrical energy from wind farms than eight percent, on average, of the total electrical energy delivered by all sources. In 2015, it was just six percent. The reason has at last become obvious to the Libs, too late to correct a failed energy policy, with the recent cancellation of 1300 megawatts of wind turbine installations. The instigators of this massive energy fraud were apparently unaware, did not heed expert device, nor did they undertake a cost-benefit analysis of the impact of wind and solar on the Ontario Power grid. 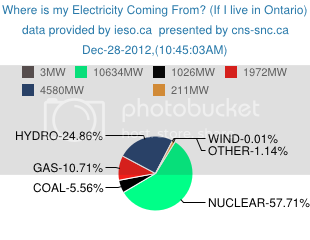 Unfortunately, Ontario does not offer the topography, the blessing of mother nature for steady winds, and an installed power generation system (nuclear, hydro, etc.) which can benefit by adding over 7000 wind turbines, blades often still, and requiring frequent back-up by gas generation. Just take a drive from Toronto to London or Windsor, east to Kingston, or head up the coast-line of Lake Huron on a calm day when the wind doesn’t blow at sufficient speed to generate a micro-watt of electrical energy, to get a sense of the scope of this energy fiasco. The decade-plus years of costly, mis-guided green energy policy have placed Ontario hydro costs among the highest in North America, if not the highest. Now this folly has been laid bare and Mr. Butts has moved on to bigger and better environmental challenges, as Principal Secretary to the PM, where his advice on the environment now impacts all Canadians, as the Federal Liberals rush to implement a complex, unproven carbon pricing policy, imposing it on those provinces which are not in favour, subjecting all Canadians to Ontario’s energy woes. A great page that shows how energy demand in Northern Ontario Canada climate is completely opposite to when Turbines generate least electricity. Ontario, currently has a bigger debt than the US state of California with one-third it’s population largely because of the billions wasted on wind energy. Assuming a low-ball installation cost of $1 million dollars per windmill means that for $1 billion dollars we got 3 MW of transitory power on that day. What an excellent investment. God help us and save us from the provincial Liberals.